Upon arrival in Brussels the first attraction you are most likely shown, is the Manneken Pis. Manneken Pis means “Little pee man” – in Flemish. We paid homage to this peeing monument after coming back from the Atomium. The peeing boy is actually a tiny bronze fountain statue. Better known as Manneken Pis, one would not normally call this art piece “majestic”, but the locals have so many stories and ways of celebrating festivals with the little peeing boy that even the toughest critic would leave with fondness for the bronze doll. Many great legends bring this little statue to life in the hearts of visitors, and the question is still: “Why was this statue erected”? Many great legends bring this little statue to life in the hearts of visitors, and the question is why was this statue erected? One story tells of a tourist father who lost his son in the city and after receiving help from villagers to find the boy, he gifted this statue to them. Another, more daring, tale is one where the boy was a spy during a siege of the city. He literally put out a ploy to bomb the city by urinating on the explosives! Many stories such as these have given the Manneken Pis a firm place in the city life of Brussels – but none would compete with its present-day glory. The famous Manneken Pis is the emblem of the rebellious spirit of the City of Brussels. His wardrobe counts more than 900 suits and the Museum of the City of Brussels presents one hundred of these suits. A multimedia database allows the visitors to view the whole wardrobe of the famous ‘ketje’. During big events, the peeing boy is adorned with luxurious clothes. Since the 18th century, Manneken Pis was dressed differently at least 4 times each year! 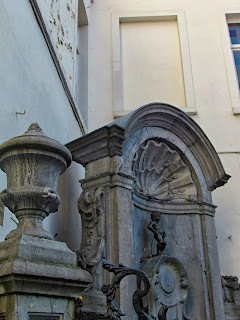 Manneken Pis was at first a fountain that played an essential role in the former distribution of drinking water since the 15th century. The system was well-known in all of Europe. Towards the end of the 17th century, the statue became more and more important in city living. It was also a survivor of the bombardment of Brussels in 1695. Manneken Pis eventually became a precious remembrance and enjoys a ceaselessly growing glory. 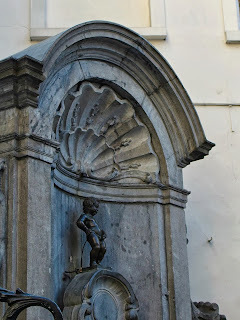 Since he lost his main function in the network of water conveyance of the City in the 19th century, Manneken Pis gradually became an image and symbol of the Brussels folklore, the joy of the inhabitants and their capacity of self-mockery. In the 80s another statue was built called Jeanneke Pis to give Manneken Pis a playmate. This other statue is a little girl fountain, but she is lesser known and hides in an alleyway a short distance away from Mannekin Pis. Wanna see more of our journey in europe? Just click the links below!! If you had fun reading through, please feel free to follow me via GFC, Google+, Bloglovin’ etc.. Unfortunately, we didn’t get to visit the Coffin Bar – Seems like a truly unique experience!